Lean Thinking: Andy & Me and the Hospital – now available! Andy & Me and the Hospital – now available! There is much opportunity, Tom-san! 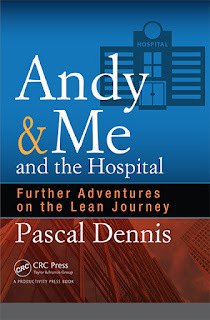 I’m thrilled to announce the release of Andy & Me and the Hospital – Further Adventures on the Lean Journey [Amazon and Productivity Press]. Tom Papas and his sensei, Andy Saito, face perhaps their greatest challenge yet – a major New York City hospital. Why a book about Toyota methods (aka ‘Lean’) in a hospital? Because health-care is a dark realm full of opportunity. If we don't get it right, it could bankrupt us. I want to answer some basic questions. What does a Lean transformation in a hospital feel like? What overall approach should we take? What kind of leadership and behavior change is needed? How do we develop and engage people? How do we improve processes? How do we build a management system? How do we translate what Deming called the ‘profound system of knowledge’? At the same time, I want to provide a clear and simple guide to Toyota methods and thinking, how they fit together, and the spirit that animates them. Why a sequel to Andy & Me and The Remedy? People seem to like Tom Papas and Andy Saito, and they’re like family to me now. Moreover, their journey is perhaps a useful metaphor for leaders at all levels. Gave it everything I got. Hope you find it enjoyable and helpful.